In 2009, the Metropolitan Museum of Art in New York accepted the loan of a diminutive marble statue known as the Young Archer. The piece had moved only a few blocks up Fifth Avenue, where it had been a fixture for many years in the lobby of the Cultural Services facility of the French Embassy. Upon arrival at the Met, the Young Archer was displayed as a work “attributed to” Michelangelo Buonarroti, indicating a degree of doubt—or at least, a prevailing lack of consensus—among experts regarding its authorship. My goal here is to summarise the essential facts regarding the Young Archer, in so far as we know them. Regarding the attribution, I do not have an opinion of my own nor do I wish to add or subtract from the many opinions that are already in circulation. The scholarly process is what interests me most, along with the mode of reporting that has characterised this case. In 1996, art historian Kathleen Weil-Garris Brandt announced the rediscovery of the Young Archer, first in a New York Times piece by John Russell, and later in a more complete analysis in the Burlington Magazine. [3,4] Owing to the great popularity of the artist in question, heated discussion around the attribution was quickly disseminated by the general press. A rational debate about the pros and cons of the attribution seemed to devolve into a commentary on the acerbic nature of the art world characters with a vested interest in being linked to a high profile attribution. Reading through the literature on this work is a challenging exercise as different experts examining the same piece emerge with varying interpretations of its author and origins. Some commentators believe it to be a nineteenth century forgery, whereas others state a firm conviction that it is an early and unfinished work by Michelangelo. [6,7] Others again speculate that it may be a Renaissance reworking of a sculptural fragment from antiquity. The methodology used by art historians to describe and document sculpture relies on a combination of documentary research coupled with detailed observation, or formal analysis. The technical assessment of works of sculpture, especially in marble and clay, is often less conclusive than in the case of paintings, since there is more scope for reworking that can not be easily detected, nor dated. However, it is possible to determine if a marble sculpture is made up of stone from different sources, including analysis of materials that may have been used to attach or repair different segments. Ultimately, the task of determining authorship for a work of sculpture involves the collation of relevant documentary data and observed intuitions, which are described in qualitative language. When these analyses are compared, the differences between experts describing the same element of the sculpture can be disconcerting for those seeking an incontrovertible standard of proof. Admittedly, given the age of the objects in question, and the fragmentary nature of documentary sources, it can be argued that an unassailable level of proof may not be possible in many cases. *The head has a light crown, but not of laurel. *The head has "broad, solid, generous" features. *Rounded facial contour and flattened eyes. *Hair shows a lack of finish; it has an overall moplike shape and varied, snakelike forms of the curls. *"Sensuous abandon of the full throat, the strange bowl-shaped chin and deeply incised nostrils," and "the swelling above the left eyelid, the shape and relaxation of the mouth," and "the long narrow nose, pinched in above the nostrils." "...the facial expression, make what you will of it but the right cheek and jaw seem planed down like carved masonry... the right ear, meticulously detailed, yet out at 90 degrees to the head." S. J. Freedberg noted animation and rhythmic complexity in the hair. Such disparate descriptions, sometimes more florid and impressionistic than precise highlight the lack of a common terminology applied to the practise of formal analysis. Were such a terminology available, comparison would perhaps be easier, as demonstrated in certain kinds of scientific reporting, or the standard language used by medical specialists to describe X-ray scans. Until technical examination is undertaken, it can only be said that the marble of the thighs, although slightly different in colour, appears to be original. There are no published comparisons indicating closer scrutiny of carved surfaces such as is possible with modern microscopy. In the absence of compelling technical data that may more completely define the marble or the author's technique in the case of the Young Archer, commentators have scoured documentary sources for clues that might indicate a tangible link to the piece. In researching this post, I undertook to collate the key sources related to this piece, ranging from a Michelangelo letter in 1497 to Lee Rosenbaum's CultureGrrl piece in December 2012. Each item marks a distinct point of data in the cumulative set of information shaping professional and public discourse on the attribution. 3PP is pleased to present this here, in chronological sequence, and in this openly accessible forum. 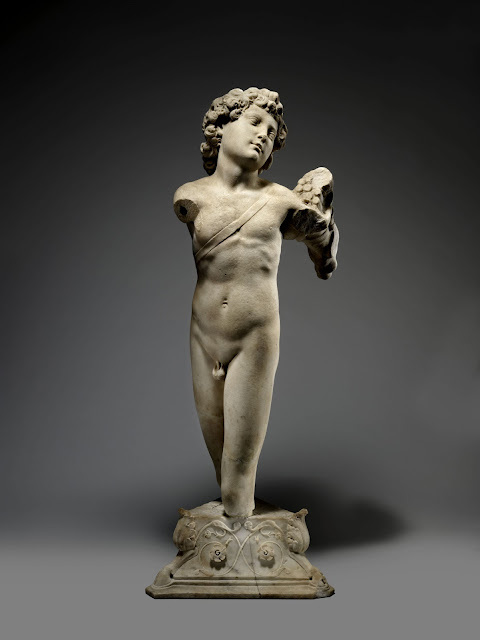 The issues surrounding Michelangelo's lost Cupid for Galli have been clouded by the promotion of a fragmentary statue now in New York as an early work of the artist....The attribution is not convincing, and a possible connection with the work referred to in the sources is, therefore, not relevant. c.1510-20 A drawing dated to this period is published by Joannides in 2003, which appeared in a Christie's sale in Paris in 2002. Joannides attributes the drawing to "an associate of Michelangelo" which is deduced from the observation of the recto (front) of the Christie's sheet showing a copy of a Sibyl from the Sistine ceiling, made from a lost preparatory study. The identity of the draughtsman working from a collection of Michelangelo's drawing is not yet known, though Joannides states Piero d'Argenta as an "obvious possibility". …percioche Messer Iacopo Galli Gentil huomo Romano, et di bello ingegno: gli fece fare in casa sua, un Bacco di marmo, di palmi diecie, la cui forma e aspetto corrisponde in ogni parte al’intentione delli scrittori antichi…Volse ancho Messere Iacopo, ch’egli facesse un Cupidine, et l’una et l’altra di queste opere oggidì si veggano in casa di messer Giuliano et messer Paolo Calli, Gentil huomini cortesi et da bene, coi quali Michelagnolo ha sempre ritentuta intrinseca amicitia. …thus Messer Iacopo Galli, a Roman gentleman of lively intelligence had him make in his (Galli’s) own home a marble Bacchus ten palms high, the form and appearance of which corresponded in all ways to the intention of the ancient writers…Messer Iacopo also wished him (literally: willed him) to make a Cupid, and today, both of these works are to be seen in the home of Messer Giuliano and Messer Paolo Calli (ie. Galli), gracious and substantial gentlemen with whom Michelangelo always maintained a close and familiar relationship. In a chamber higher up near the principal room is found… a full-length Apollo with the quiver for arrows at the side and he has a vase at his feet: it is likewise a work of Michelangelo’s. 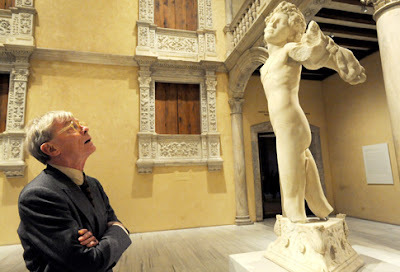 ...ed in questa forma fu dipintodal nostro Tiziano, appoggiato sopra la spalla di Venere...siccome dal divin Michelangelo fu scolpito in marmo in Roma a Giacomo Galli. ...and in this form it was painted by our Titian, leaning on [alternately: over] Venus’ shoulder…and it was likewise sculpted in marble by the divine Michelangelo in Rome for Giacomo Galli. 1650 Jacomo Manilli, describes a statue in the private garden at the Villa Borghese. From documentary sources, it has not yet been determined how the sculpture may have passed from the Galli collection the Villa Borghese gardens. Cupido senz'ali, coll'arco à i piedi, appoggiato ad un vaso,e con le saette involte in una pelle di fiera. Cupid without wings, with the bow at this feet, leaning on [alternately: resting on] a vase, with the arrows wrapped in the skin of a wild animal. 1759 - c.1773 Apparently made during his time in Rome, Jean-Robert Ango's drawing of a similarly posed figure was found by James Draper at the Cooper-Hewitt Museum in New York and published in 1997. This drawing is cited as proof that the sculpture was intact in the eighteenth century. Another version of this figure by Ango is seen in a drawing at the Louvre, dated c.1770, and published by Joannides. There is no inscription on either drawing verifying an exact location or date. The 1650 description by Manilli has led to the speculation that the object depicted was displayed in the garden at the Villa Borghese. The Cooper-Hewitt drawing by Ango published by Draper in 1997. 1902 The Bardini catalogues for Christie's provide the first concrete link with the object in New York, with measurements and a published photograph allowing for clear identification. Florentine art dealer Stefano Bardini's catalogues for Christie's London May 27 were published in French and English. The French version attributes the sculpture to Michelangelo and mentions a Borghese provenance. The English version of the catalogue for the same sale contains a different attribution. The sculpture was not sold. Florence XVIe siècle. Travail de Michel-Ange Buonarroti./Pièce extraordinaire. Cette statue, grandeur naturelle, faisait partie du Musée Borghèse, de Rome, et fut vendu par le prince Borghèse, pour éviter que'elle ne fut comprise dans la liste des statues considerees comme fidei-commise. Une des marques caractéristiques de Michel-Ange est ici très remarquable: la sveltessee de la taille, vue de profil. Les cheveux bouclés sont aussie d'une manière special au grand artiste florentin et travaillés commme ceux de la statue de David. Marbre./Hauteur, mais sans socle, 0.97. Florence Sixteenth century. Work by Michelangelo Buonarroti. Extraordinary piece. This statute, life-sized, was part of the Borghese Museum in Rome and it was sold by Prince Borghese so that it would not be included in the list of statues considered entailed property. One of the characteristic indications of Michelangelo is very notable here: the slenderness of the waist, which is seen in profile. The curly hair is also in a manner particular to this great Florentine artist and such works as the statue of David. Marble. Height, but without a base, 0.97. Describes the work as from the School of Michelangelo. A statue, in white marble - 40 in. high - School of Michael Angelo, 16th Century./ The head inclined towards the left shoulder, over which is slung a quiver bound with a lion's pad, the face slightly upturned. The arms and lower extremities of the legs are missing/. Attached to a triangular marble pedestal of 15th Century workmanship, sculptured with goats' feet at the corners and tendril ornament in low relief - 74in. high. (No. 547, pl.35)/ From the Borghese Museum at Rome. 1903 Charles Holroyd, keeper of the National Gallery of British Art (now the Tate) in London publishes a translation of Condivi's biography of Michelangelo, also including a catalogue of his sculpted works. Holroyd mentions that the Galli Cupid described in the sources had been linked to a sculpture at the Victoria and Albert Museum in South Kensington. This work, a kneeling figure had been attributed to Michelangelo by writers including John Addington-Symonds and Anton Springer. Holroyd rejects the attribution, but does not mention the absence of the vase at the foot of the South Kensington figure as described by Aldovrandi. By 1945 this piece was stripped of its attribution to Michelangelo, and is still at the Victoria and Albert Museum, labelled as a Narcissus. 1905 The Young Archer is purchased in Italy by Stanford White, architect of the Payne Whitney House in New York, where the sculpture was intended for the Renaissance inspired rotunda. Correspondence cited by Brandt (1996) between White and dealers in Rome show inconsistencies in the descriptions applied to the object, with one letter describing the piece as an antique "Hercules (little marble from excavation)." An attribution to Michelangelo is not apparent in the correspondence between White and the Roman dealers acting as middle men for Bardini. 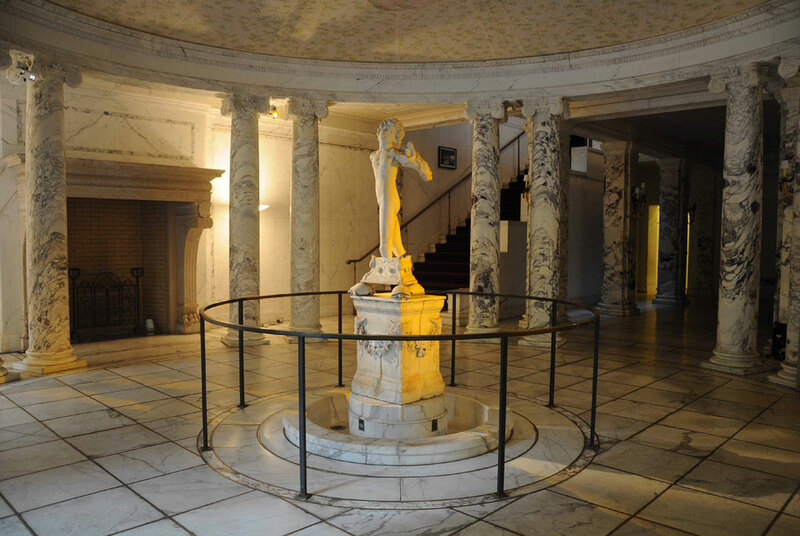 1908 The Young Archer is installed in the entrance hall of the Payne Whitney House. The rotunda of the (former) Payne Whitney House, with the Young Archer decorating a fountain. 1953 The French government acquires the Payne Whitney House, along with the statue which is described as an asset of the property. 1968 Alessandro Parronchi publishes the work as by Michelangelo, using the 1902 Bardini catalogue photograph and documentary sources. 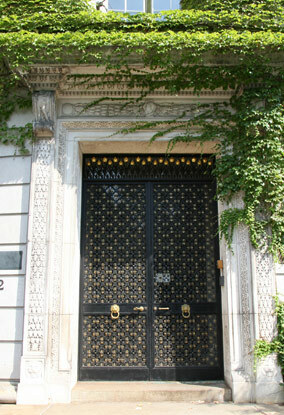 It is listed as an untraced object, as the author was not initially aware of the 1905 sale of the piece, or its relocation to New York. After the 1996 rediscovery of the Young Archer, Parronchi publishes an article re-affirming his attribution of the piece to Michelangelo. c.1980 Art historian Colin Eisler is reported to have been conducting an independent investigation into the Fifth Avenue piece, discovering that the link to Michelangelo has already been made by Parronchi in 1968. He did not publish on the Young Archer until after Brandt's announced her rediscovery in 1996. 1983 James Draper first sights the work at the French Embassy Cultural Services building while on a Fifth Avenue bus. He later returned to view it more closely, but did not initially believe that it was by Michelangelo. The veracity of this story is questioned in the 1996 article by Kornbluth in New York Magazine. In 1984 I was in New York for an exhibition of my sculpture when I walked into the French Embassy to view an art exhibition in the lobby and recognized the Cupid as being the lost Michelangelo. I asked the receptionist if she was aware of the sculpture's provenance and she said nobody knew. I said I thought it was a Michelangelo and returned later with my camera and took pictures of it. I attempted to communicate my discovery to the Metropolitan Museum of Art's director, Philippe de Montebello, but he did not return my call. Upon my visit to New Orleans that year, I told William Fagaly, co-director of the New Orleans Museum of Art, of my discovery as well as my art dealer, Timothy Foley, who made inquiries to the Getty Museum about acquiring the piece. The real story about "Cupid" is not its discovery, but that in the world's center of museums and galleries, this treasure was overlooked for 90 years. 1986 In April of this year, journalist Jesse Kornbluth is shown a photograph of the Young Archer by Barbara de Portago and Lorraine Dyess from the New York Academy of Art. Later they inspect the sculpture at the French Embassy Cultural Services building. In a March 1996 article published in New York magazine, Kornbluth reveals the connection between sculptor Robert Schoen and how this information eventually reached Dyess. An initial bid to sell the sculpture to the Getty fell through, perhaps due to the fact that the attribution was not firmly established in current scholarship. Kornbluth reveals he has contacted Renaissance experts Everett Fahy and John-Pope Hennessy, though neither were interested in going to view the statue with him. 1992 Draper publishes the Young Archer as a work by Bertoldo di Giovanni, in his catalogue of the work of that artist—reflecting his opinion at that time. Bertoldo was Michelangelo's (alleged) mentor during his training in Lorenzo de' Medici's sculpture garden at San Marco. 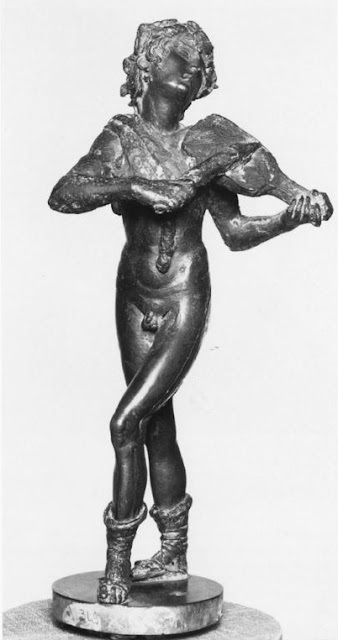 This small bronze depicting either Apollo or Orpheus is commonly attributed to Bertoldo di Giovanni and is cited by Brandt, Draper and others as a key influence on Michelangelo for the Young Archer. Beck (1998) notes that this attribution is also not universally accepted. Brandt's rediscovery is first reported on January 23 in the New York Times. Later that year, her article in the Burlington Magazine is published. Writing in the Wall Street Journal on February 29, Lee Rosenbaum summarises the evidence presented to date, and describes the initial reactions to the Brandt announcement via the New York Times in the previous month. Rosenbaum's article includes comments made by Leo Steinberg, James Beck, and Creighton Gilbert, each expressing doubt regarding the attribution, but with each also awaiting the upcoming publication of Brandt's complete analysis in the Burlington. Journalist Jesse Kornbluth interviews Draper and Brandt for the New York magazine, also revealing his personal involvement in a previous inquiry into the statue in 1986. Brandt during the rediscovery heyday in 1996: a two page spread in New York magazine. Leo Steinberg writing in ARTNews rejects the attribution to Michelangelo. Lee Rosenbaum writes another extensive summary of the case and reactions in Art in America. Lee Rosenbaum summarises the Louvre officials' response in a piece for Artnet. July Michael Hirst writing in The Art Newspaper, also rejects the attribution to Michelangelo, giving it instead to Bertoldo. October Colin Eisler, writing in Apollo proposes a more complex explanation. 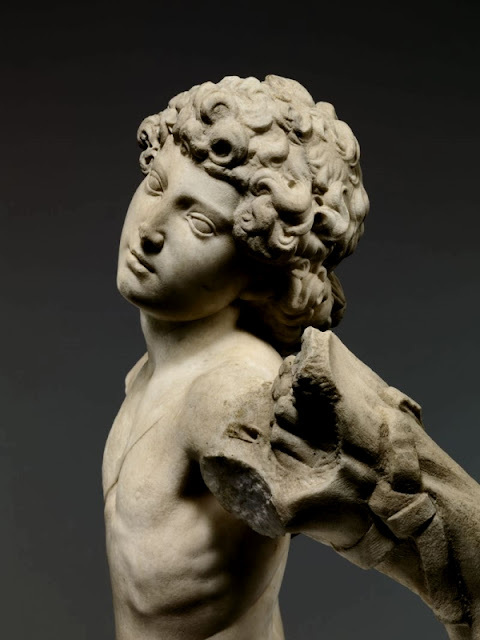 He suggests that the Young Archer might (also) be an amalgam of ancient and more recent sculptural elements, including work by a Florentine sculptor, perhaps Michelangelo. (This theory shares similarities with the case of the Narcissus at the Victoria and Albert Museum, which was once believed to be Michelangelo's Cupid for Galli). Significantly all three art historians to be first concerned the Payne Whitney statue prior to its recent 'rediscovery' were Bertoldo specialists. Most recently, Michael Hirst has ascribed the Payne Whitney marble to Bertoldo...But the work is in several ways closest to the images by, or ascribed to, Bertoldo's best known disciple, Michelangelo -particularly his marble relief of the Battle of the Centaurs (Florence, Casa Buonarroti)...As the Payne Whitney statue is not yet recognized for what it is -a renaissance forgery of an antiquity--this dimension, that is to say, of 'imitation', so critical to the young artist's genesis, has been overlooked, yet may well buttress Parronchi's attribution. Michelangelo's youthful propensity, very much in the Florentine tradition, for imitation, and his own, for deception, call for exploration. October Brandt's Burlington piece is published, outlining the case for the attribution to Michelangelo. Brandt explores relevant visual sources, reveals the catalogue entries from the 1902 sale and also acknowledges Parronchi's contribution. This article, along with Beck's response in 1998 contain the most extensive descriptions of the Young Archer. 1997 Follow up notices appear in the Burlington Magazine by Brandt and Draper; the former reveals the Manilli source offering a (possible) provenance back to 1650 ; Draper adds the Ango sketch, arguing that it shows the sculpture was still intact in the eighteenth century although there is no record or inscription confirming when or where Ango made this drawing. 1998 James Beck's methodological summary is published in Artibus et Historiae. Beck speculates that the work is either a later 16th century piece, or a nineteenth century forgery, but admits the difficulties in conclusively proving either theory. 1999 The Young Archer is displayed at the Young Michelangelo exhibition at the Palazzo Vecchio in Florence. 2000 The Young Archer is placed on display in the Louvre between February and April of this year. It is reported at this time that leading French scholars did not support the Michelangelo attribution. 2003 Paul Joannides, writing in the Burlington Magazine, proposes another drawing, purported to be a study after Michelangelo by an associate. It is argued this represents the earliest drawing related to the piece, dating from 1510-20. A second Ango drawing is also revealed via the Louvre. Prior to 2009 much of the discussion and reaction regarding the Young Archer had occurred in printed articles. The loan of the statue to the Metropolitan Museum in New York signaled the beginning of the first extended discussion of a high profile Renaissance attribution to occur primarily on the web. A sample of online reports by key commentators is offered below (with links in references). 2009 The Metropolitan Museum New York acquires the sculpture on loan for a period on 10 years. It is advertised, and labelled as a piece "attributed to Michelangelo". Draper also records his views in a podcast. Like water, attributions tend eventually to find their own level...they oftentimes start high and gradually descend. But I’m perfectly happy to have this in the public domain and on public display for a decade, rather than in the French cultural attaché, because it wasn’t really available. This is how connoisseurship and attribution should work. Not by current consensus but consensus over time. And consensus over time is usually unforgiving, but for the most part correct. June Lee Rosenbaum publishes a piece at CultureGrrl, commenting on the loan and the contested nature of the attribution, also including a summary of her previous coverage. What's on display, in other words, is not so much a sculpture as a fragment of doubt... Given our coarse culture, when shrill demands for certainty on the day's assorted topics are loudly made, it's beneficial to be reminded that there's a lot that we don't know about many important things...And, in fact, that we might never know for sure. October Lee Rosenbaum posts a follow up at CultureGrrl describing the Met's display of the Young Archer. 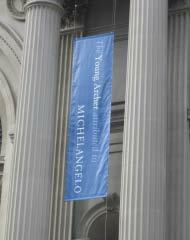 This post includes a photograph of the banner at the front of the Met that included the words "attributed to" in dimmer colours than "Young Archer" and "Michelangelo". James Draper's decision to lift the "attributed to" label from the work is reported by Lee Rosenbaum and quickly spreads across the world wide web. To date no new evidence has been offered by scholars for or against this attribution. The current loan to the Metropolitan Museum in New York expires in this year. Although it was reported in 2009 that the French Cultural Attache had intended to sell the building (of which the statue was an asset), this sale did not proceed, and the statue remains the property of the French Government. In cases involving a high profile artist, a discussion of attribution can quickly become global news. Such instances provide a compelling glimpse into the nature of the attribution process, and the means by which galleries and owners aim to achieve a consensus by re-igniting discussion and publicity around a piece. In the case of the Young Archer, successive rounds of commentary on the piece since 1968 have brought us no closer to the author in a definitive sense. Until new documentary evidence is presented, or technical analysis provides a higher fidelity of data, a conclusive attribution for this work seems elusive. As the loan period to the Metropolitan Museum expires in 2019, we can expect to see the Young Archer re-enter discussion in the future. This post owes a great debt to Lee Rosenbaum, journalist and blogger at CultureGrrl whose prolific and highly accurate reporting has kept the world aware of developments in this case, and many others. Many thanks also to Dr. Edward Goldberg for the translations of sources cited in Italian and French. 2. Transcribed from image posted by Rosenbaum in 1. 6. See Russell listed above and Rosenbaum Feb and April 1996. Each of these contain direct quotations by Brandt made during the course of the initial announcement prior to the publication of the Burlington article published in October 1996 (as cited above). 8. Eisler, C. Michelangelo and the Payne Whitney marble. Apollo. 144. October 1996. 10. Brandt 1996. As cited above. 11. Draper 1997. As cited above. 12. Brandt 1996. As cited above. 13. Hirst, M. Michelangelo: The Achievement of Fame. Vol. 1. Yale University Press. 2011. pp.30-32. Cited in post text is Hirst's comments in note 17. p.280. 15. Joannides, P. Michelangelo's Archer: Culture and Style. Video from the Michelangelo Symposium at the Metropolitan Museum New York. May 2012. Accessed January 15 2013. 16. Vita di Michelagnolo Buonarroti raccolta per Ascanio Condivi. Rome. 1553. p.11-12. 17. Aldrovandi, U. Le Anticita della citta di Roma. Venice 1556 and 1558. Reproduced New York 1975. p.168. Cited by Brandt (1996). 18. Le opere di Giorgio Vasari. Milanesi, G (Ed). Sansoni. 1906. Vol. VII. P.149. 19. Lomazzo, GP. Trattato dell'arte della pittura, scultura e architecttura. III. Rome. 1844. p. 96. lib. vii. cap. x. Cited by Pope-Hennessy (1956). 20. Manilli, J. Villa Borghese fuori di Porta Pinciana Rome. 1650. p.146. For the Villa Borghese collections, see Alveram, K. Die Antikensammlung Kardinals Scipione Borghese. Worms. 1995. (published 1996). Cited by Brandt (1996). 21. Draper 1997. As cited above. 22. Joannides 2003. As cited above. 23. Catalogue des Objets d'art, antiques, du Moyen Age et de la Renaissance, provenant de la Collection Bardini de Florence. London. 1902. p.89. No. 547. Cited by Brandt (1996). 27. Beck (1998) provides a complete (to date) summary of the publications and revisions of Parronchi's work related to the Young Archer. 28. Kornbluth 1996. pp.30-31. Questions Draper on his first sighting of the statue. nb. whatever the circumstances of Draper's first sighting of the statue may have been, it seems that his and Brandt's 1995 viewing under stronger lighting was a definitive moment for their work on the attribution. The problem is that there are aspects of this story that don't add up. Draper's first sight of the statue, for one. I called him and asked if he was sure he saw it from a bus. "From a bus, yes," he said. I reminded Draper of the heavy ironwork of the doors. "Maybe I was waiting for a bus." "Across the street from the building?" That would place Draper some 60 feet from the sculpture. I find his eyesight impressive. 30. Kornbluth 1996. As cited above. 31. Draper, J. Bertoldo di Giovanni: Sculptor of the Medici Household. University of Missouri Press. 1992. pp.171-172. 32. Draper 1997. As cited above. 35. Steinberg, L. The Michelangelo Next Door. ARTNews. April 1996. 36. Rosenbaum. L. Michelangelo/Not Michelangelo. Art in America. April 1996. Cited by Rosenbaum in the June 3 2009 CultureGrrl post. (see 34). 38. Hirst, M. The New York Michelangelo: a different view. The Art Newspaper. No. 61. July-August 1996. 39. Eisler 1996. As cited above. *Narcissus via V&A website. See 28 in references. *Young Archer side 3/4, rear via Brandt 1996, low resolution screen capture, digitally tuned and used in accordance fair use guidelines. *Kornbluth article in New York magazine scan via Google Books. *Met banner image by Lee Rosenbaum. See 45 in references. Thank you for this incredibly lucid summary Hasan. I always marvel at your ability to wrangle so many sources into a reasoned and well paced presentation for all to enjoy. I keep looking at that Ango drawing, particularly the strap across the chest and notice it seems different from the one depicted in the Joannides presented drawing, and the Young Archer itself. It is curious to read of Bardini's lack of consistency between two 1902 catalogues. It seems he did not think it possible to pass the work as a Michelangelo to English buyers/institutions? This perhaps makes strategic sense given the V&A "Narcissus" at South Kensington was still being debated at the time (which you have cleverly illustrated with the Holroyd reference). The 2012 symposium videos are telling. If anything, it perhaps convinced James Draper that he should unceremoniously edit the museum label! Your dedication to Aaron Swartz is deeply moving. It is hard to accept such an innovative mind is now gone, and over what? Kudos to the amazing Lee Rosenbaum, she seems to have her eyes on everything and everyone! Continue, Hasan. You must, of course! Wow, Hasan, this is quite something. I honestly was not even aware of this piece or the controversy over its attribution, so thank you for bringing it to people's attention and, of course, for providing such a detailed and accessible discussion. I will look forward to seeing what happens next with this piece. I really liked what Christopher Knight said...there are so many things we do not and may not ever know. Kudos to you and the mythic Lee Rosenbaum for forcing us to confront the hitherto "elusive obvious"--separating what we know from what we don't know, with a refreshing lack of drama. I also hope that the terrible death of Aaron Swartz will engender a bout of collective soul searching. Might that happen? I am perplexed by your insistence that there needs to be a "common terminology applied to the practise of formal analysis," not unlike the terminology used to read an x-ray. Doesn't the development of such a terminology assume a "norm?" The musculo-skeletal system of the human body exists, in the vast number of cases, within a range of "normal," enabling us to describe problems/abnormalities with a codified language. In the case of art, would you propose that separate terminology exist for different media? different artists? period styles? What would be our "norm" in the case of Michelangelo, for example (or Raphael, if you prefer)? It comes down to the difficulty in describing the subjective experience of "seeing" using written language. On some level, I like that subjectivity - different people see and notice different aspects of the same work of art. Their subjectivity, however difficult it makes attribution, might enable us to see a work differently or afresh. I'm not sure a "terminology" would accomplish the same thing. Also - do you know the verb Parronchiare? Also, as someone who was at the Met for the symposium in May - I can tell you that there was no debate. We were not invited nor encouraged to ask questions of the speakers. @Stephanie - your observation about the strap is well made. Why does Ango's drawing look different, and also not the slender youth we see today? Beck had issues with it of course, and even some of the commentators in favour of the attribution have asked similar questions of the Young Archer's physique. As there is not a great deal of surviving or analogous examples from Michelangelo's period in Lorenzo's sculpture garden, valid comparisons are always difficult to make. @Jenna - I really liked Knight's comment as well. In reading some of the more forceful pledges for and against the attribution, some of them using language like "I was instantly converted"(! ), it was refreshing to read one writer who was happy to acknowledge that we may not be able to ever discern the complete truth. @Ed - how obvious can it be made? At least when the sculpture was first unveiled at the Met, it was as part of a dossier exhibition and included much of the information presented here to inform any one that may be interested to know more. As I type this, the Met Museum's refurbished site has no direct entry for the Young Archer. It does have the podcast and the symposium videos, which are interesting, but less useful for research purposes. Aaron Swartz death seems to have galvanised certain commentators and groups into action, the longer term impact of this tragic event are presently difficult to discern. @Anon - thank you for your insights. My suggesting the use of standardised language to make comparison "perhaps be easier" is hardly insistent, is it? The example comes to mind as I read X-ray reports daily, and would dread to see them written in verbose blocks of descriptive language. It is unfortunate that the May Symposium did not allow for debate. Colin Eisler's presentation was at once amusing, if not vexing - choosing to ignore the Young Archer entirely and focusing on the base instead. I do know the verb you mention, and I have no interest in indulging in that type of judgement. This is definitely not the place for that kind of thing. I meant no offense with the Parronchiare - I simply felt that it was germane to the discussion of the difficulty of attribution. I like subjectivity also, in some situations--and art history and art criticism would be unthinkable without it. But attribution studies have not always been well served. I have had far too much experience with people attempting to outblab each other with "more sensitive and perceptive than thou" descriptive commentary--sometimes even talking over hard documentary and laboratory evidence. A checklist of points that need to be addressed or at least acknowledged would be a great way to discourage "buffet table attributions" (picking and choosing the visual evidence we wish while ignoring the rest). Scholars are sometimes guilty of that but--frankly--dealers and auction houses almost always are. Unlike Hasan, I don't know the verb you mention, having encountered only the nominative form (as in "fare una..."). The Young Archer's (non integral) base is of enormous interest, I think, as is the architect's contextualization of the work. Am I the only one who thinks that a argument can be made for keeping the Young Archer on site, as the essential focus of an important Stanford White interior? What is now in its place? At least a copy, I hope! An amazingly thorough and insightful recap of the "Michelangelo of Fifth Avenue's" convoluted controversy! My warm thanks, Hasan, for your gracious acknowledgements, as well as for the very kind tribute from the first anonymous commenter. To commenter Edward Goldberg: I'm not "mythic"; I'm real! I blog, therefore I am. @Edward Goldberg - I absolutely agree that many attributions are made on "feeling" and without recourse to appropriate scientific and provenance studies. Such practices should be avoided, but I don't know if we fully understand how expensive and difficult some of those scientific tests are and how few places have labs equipped to carry them out. In the case of the archer, the terms of the loan might even prohibit it. In the case of auction houses, they actually don't have the legal onus (as I understand it). Buyer beware! There is also an epidemic of scholars who believe they *should* have found the next masterpiece and their attributions can be really strange, made even more difficult to refute because of the stature of the scholar. Anonymous, I see that you and I agree on the main points. Laboratory tests can be expensive and there is little incentive to realize them (or even consider these findings,when they already exist) since many people would rather invent pseudo-data. Whether or not there is a legal onus on dealers and auctions houses to offer full disclosure (actually, I think there sometimes is! ), it is difficult to make a moral (let alone scholarly) argument for their behavior. Meanwhile, the Bargello's Apollo/Archer is in Washington only as a temporary loan--and it will be returning to its home here in Florence in due course. I certainly agree that "discoveryitis" has reached an epidemic level and is the scourge of art history today! You've put in an enormous amount of work on this post but would anyone be interested in this statue if it wasn't for the possibility of a Michelangelo attribution? One comment even stated that Colin Eisler even neglected the statue and concentrated on the stand. I know that you like scientific analysis, but can there be a scientific way to assess the quality of a work of art? Thank you to all for the contributions. @Ed - if you peruse auction houses' sites and access the condition reports that are sometimes made available - you will now regularly find a hefty disclaimer attached to them. It is interesting that they can list a work as by a particular artist or their school (etc), but still have this distance when it comes to supportive data. It is an issue best contemplated by legal types of course. @anon - Great example! Hair curls were used as points of comparison by Brandt - in her case citing the Manchester Madonna as a correlative. Ideally, it would perhaps be more useful to have examined a larger (sample) selection, looking at characteristics produced by Italian sculptors including Michelangelo during a set time period. Given that Michelangelo often left unfinished sections, under visible light and higher magnification, this could reveal much about how he used his tools, and possibly provide valid points of comparison. @Frank - If this piece was not linked to Michelangelo, we would not be having this discussion in a public forum with participants from many nations. Scientific testing (and reporting) would ideally distance itself from statements about the subjective quality of an artwork. Such testing can reveal the materials and methods used, which itself may show patterns when a larger selection of this data is available for comparison. Rather than use nebulous terms like "quality" - if a particular artist has a technical virtuosity or characteristic that can be consistently demonstrated, this would be more useful than any subjective description of it. From what has presently been made available, how exactly can one distinguish "Carrara marble" for example? Is it a visual or chemical comparison etc? This was not made apparent in any of the published reports on this piece. @Lee Rosenbaum - a great honour to have you visit 3PP. It is a convoluted case indeed. Many thanks, and I concur with your "blogito ergo sum"! Thank you Hasan for this clear and logical reconstruction. To see such careful research openly on the web is a special sign of our times. I hope more will follow your example. You are correct to notice the lack of records demonstrated by the New York scholars from the archives of Bardini. These may reveal how Stefano Bardini and his associates came to acquire this statue or fragments of it. To access the archives of these institutions in this country is a great diplomatic operation, we may still wait for a long time. Thank you for your comment Mauro. It is an interesting dimension to this case. We can only surmise what may lie in the Bardini archives to clarify the pre 1902 provenance beyond the hypothetical. In the 1996 Burlington publication Brandt makes a quick admission in the notes "Bardini's Florentine papers are not yet available for consultation".